The 80mm ED has become so well regarded for its performance and value that we hoped the design would be scaled up to produce a telescope with a larger aperture, one that would be even more suited for astronomical applications. And finally on 6 August 2004 the new telescope was introduced to the world at Company Seven as the 100mm ED telescope. The introduction in August 2003 of the Orion 80mm ED telescope optical tube assembly was greeted with much praise and enthusiasm. The Chinese maker contracted by Orion to produce this new telescope proved China was becoming a force to be reckoned with, in some terms tickling the more upscale market areas of optics. The 80 ED demonstrates it is possible to buy a telescope that does not claim to be the finest in the world but is one heck of a good balance between aperture, focal length, overall optical performance and cost. Not long after the introduction of the 80 ED OTA Orion packaged it with the SkyView Pro German Equatorial Mount so it is also made available as the "SkyView Pro 80mm ED EQ", a complete astronomical telescope described herein. Right: theSkyView Pro 80mm ED EQ telescope. Also available for sale as an optical tube assembly alone. (28,460 Bytes). Orion developed this 80mm telescope lens design so that it can be readily produced solely for Orion and deliver a rewarding experience on the planets or deep sky. The 3 inch (75-80mm) Apo refractor is regarded as a highly desirable multipurpose compact telescope - an excellent start into the hobby and a good lightweight alternate for those who own larger telescopes. These Apos get used more often than larger alternatives because they are readily managed, even useful on simple Alt-Azimuth mounts. They can deliver the light gathering and high contrast resolving power necessary to reveal many celestial objects with a very natural almost three dimensional appearance. Moderate aperture Apos provide a wider span of Field of View than any Reflecting or Catadioptric design with an aperture that can show similar detail, while they can reach the critical 200x threshold of planet and lunar observing that reveals details and changing features from night to night. And with their 2" Focusers, these telescopes can interchange accessories with larger telescopes which one may take out only on the steadier and more transparent nights. ED Glass the air spaced doublet objective lens of the 100 mm ED is designed to provide precise optical color correction, and it is multicoated to improve contrast and transmission across the visual spectrum. The objective lens incorporates an Extra-Low Dispersion Fluorocrown FPL-53 extra-low dispersion "ED" optical glass from Japan; this is a glass crown element developed under laboratory conditions. Colors of the spectrum have differing wavelengths, to see this notice how in a normal optical glass prism the red and blue rays are bent at slightly different angles as they pass through. This dispersion results in color fringing that when looking through a telescope or telephoto lens usually appears as a slight violet halo around one object that contrast one against the other, and this can cause an overall lack of sharpness. In camera normal and wide-angle lenses this is imperceptible or can be corrected with other techniques, but telescopic lenses magnify the variation in focus between red and blue light rays. So the camera lens making companies (Carl Zeiss, Nikon, and Canon) pioneered Extra-Low Dispersion glasses and Fluorite crystal technologies to solve this problem. This ED glass material provides reduced chromatic aberration over similar f ratio achromatic designs in portions of the spectrum from the D (yellow), through C (red), F ( blue) and G (purple) Fraunhofer lines. The good performance and low cost of the telescope is made possible in part by the low wages paid in China, the ready supply of cheap crown glass, and to degrees of automation and speed in manufacture. This process produces a lens made to a prescription that is good enough to provide views free of false color that are acceptable at up to about 60x per inch of aperture which is somewhat less than premium Apos. While this ED lens is not as esoteric in deign or materials as those of our most advanced Apos such as the Astro-Physics 92 f7 triplet Apo, and TeleVue 85 f7 Doublet Apo, the cost of the complete Orion 80 mm ED telescope will be a fraction of the cost of its superior cousins. The Orion 80mm ED will remain a lightweight, user-friendly, quick set up an go telescope capable of providing a lifetime of good service. What does it do? the Apochromatic refractor has been the traditional choice of visual astronomers. The combination of thermal stability, best view per pound of telescope, clear high contrast images, and apparent brightness can surpass more bulky designs such as the 8" Catadioptric and Newtonian telescopes. And the versatility of field of view and range of magnification is unrivaled by all other telescope designs. This portable telescope provides stunning lunar and planetary observing; it can clearly reveal the major changing features on several planets through out observing seasons. You may imagine you are seeing details on the moon as if you were in orbit - even though the smallest object you could see with this telescope will actually be about 6 kilometers in diameter! And yet it is so compact and lightweight that a child can manage it. The focal length of the 100mm ED is made even shorter still with the optional focal reducer offered by Company Seven to our 80mm ED customers. This photograpic accessory delivers a 5 degree wide field of coverage at f6 for terrestrial or astrophotography. left: Orion ED telescope locking 2" Focuser and Reducer to 1.25". 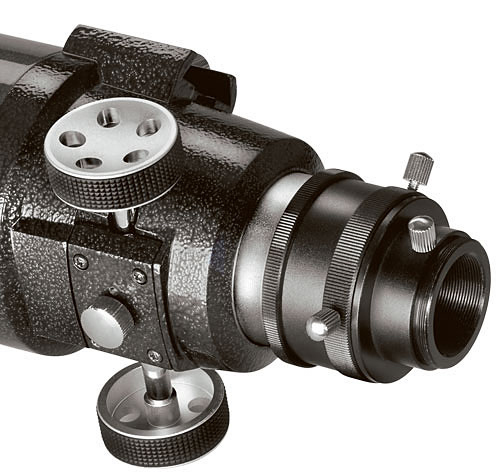 Notice the innovative arrangement of the Focuser Lock, this prevents marring the drawtube as is common with many other telescopes (52,574 Bytes). 2 inch Focuser Aside from brilliant performance at higher magnifications, the telescope is quite at home sweeping the Milky Way, or Comet hunting. 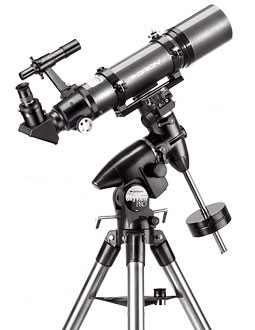 This is an easily manageable telescope with the unobstructed 80mm light gathering power and fields of view to recognize many of the popular bright deep sky objects. Tease subtle details out of the Great Nebula in Orion, the Andromeda Galaxy. See the entirety of immense nebulae including the Veil. Seek out more deep-sky wonders including Star Clusters, and Planetary Nebulae, etc. Try a TeleVue 55mm Plossl eyepiece on for size, working at 11x provides a true field of 4.4 degrees. The combination of field of view and light gathering power will make hunting the large deep sky objects very rewarding, even more so with optional light pollution rejection filters. Or take the plunge into awesome perfection of the TeleVue 22mm Nagler at 27x showing 2.3 degrees - suitable for both astronomy and nature watching, with a view akin to looking out of a port hole! Notice the innovative arrangement of the Crayford style Focuser and Lock; this a low maintenance friction drive which eliminates the conventional focuser's use of a Rack and Pinion and need for lubricants. The adjustable set screw applies pressure to the Focuser Pinion to attain the proper adjustment of the friction control, this adjustment is critical. The downside of this arrangement is that it requires a bit of practice for someone used to working with a conventional rack and pinion focuser. Orion 2 Inch Mirror Diagonal (or "zenith") mirror provides a comfortable viewing position for the observer by diverting the cone of light coming from the telescope to form an image 90 degrees off axis. The view when using the telescope as it is provided will appear to be right side up, and is reversed left to right; this is not usually a problem for astronomy or nature observing because the image quality provided by the high quality mirror and 2 inch diameters panoramic oculars is exceptional. This Diagonal is made China. It incorporates a front surface aluminized mirror that will provide a number of years of good service. This is a good value providing good clear views at lower to middle magnifications. We do wish the provided set screws were situated a bit further away from the accessory down on the female 2" fitting since the knurled knobs do just protrude above the top of the fitting thereby interfering with the complete seating of larger eyepieces and accessories. Smaller metric threaded thumbscrews might do but these are less comfortable to operate. However, a perceptible increase in brightness at all magnifications and a noteworthy improvement in clarity of detail at higher magnifications can be seen if one replaces this mirror with an improved alternative such as the Astrophysics "Maxbright" or TeleVue "Everbrite" mirror diagonal. These superior alternatives feature a high-tech dielectric coating which provide optimum performance and a lifetime of use. These diagonals have no aluminum or other reflective metal coating, instead the reflective surface consists of 52 layers of thin film oxides similar to those used in anti-reflection coatings. The coatings are deposited by an electron beam evaporator at a high temperature. The result is that reflectivity is above 99% over the entire 4000 to 7000 Angstrom photo-visual range. Thin film coatings have extremely low surface scatter compared to aluminum or enhanced aluminum coatings; examination with a laser source shows approximately a five fold improvement in surface scatter. These have mechanical design features that also make them desirable including non marring clamp fitting, and the ability to accept thread in 48mm filters. On the matter of an optional Image Erecting Prism, while Company Seven does offer optional 45 degree inclined image erecting prisms these can only accommodate 1.25 inch diameter oculars. There are no image erecting prisms that can fully illuminate the Field Stop of all 2" oculars. Furthermore, erecting prisms will not provide image quality to equal that of a good mirror diagonal and this will become particularly apparent when observing at higher magnifications. However, for moderate to medium magnification applications where one needs correct images (to read distant writing, etc.) then the optional prism may be suitable. a complete working telescope right out of the box! The capability to easily center and then smoothly track celestial objects as they drift across the sky. This becomes particularly desirable when operating at those higher magnifications necessary to observe some of the brighter deep sky objects, and the more subtle features on the planets. Capability to accept electronic single or dual axis tracking drive. This can make the observing session more pleasing for an individual or for any group of people: a family, or with young children, or when sharing with groups of persons who may lack experience using a telescope. The German Equatorial Mount facilitates teaching a number concepts in astronomy including the Coordinate System used for Celestial Navigation. Slow Motion Manual Controls: the mount incorporates fine geared worm gear sets with large hand knobs on each of both axes to facilitate centering the telescope onto a target, and to permit one to manually guide the mount to keep it on target. The motion on both axes is regulated by clutches which can be adjusted to let you guide the telescope with just the lightest touch from one part of the sky to another. The optional motors made for the SkyView Pro also include clutches to permit the override of the motor while tracking by the manual geared controls. This is a feature normally not provided on mounts of this price, while this may be an option even on more costly alternative mounts. Elevation and Azimuth adjustment to facilitate pole alignment of the mount, manual screw drives are provided. This makes it possible to move the mount head (without moving the tripod) to the left or right, up or down precisely. This makes getting that last, fine pole alignment adjustment easily. And once aligned, these controls have opposing screws that can be brought to bear in order to secure the mount even more rigidly. Setting Circles: engraved with numbers corresponding to the two dimensional "Right Ascension" (R.A.) and "Declination" (Dec.) coordinate systems used by astronomers to navigate the night sky. These help you to learn about the Celestial Coordinate System, and help you to locate objects in the sky by their cataloged coordinates. Company Seven also does offer optional electronic Encoder and digital display devices as aids to celestial navigation which can be added to the SkyView Pro however, most of our customer do not buy these add-ons since they enjoy the thrill of discovery as they learn to "Star Hop" from one object in the night sky to another. R.A. Axis threaded and Declination shaft perforated to accept optional Pole Alignment finder telescope. The SkyView Pro Field Tripod is surprisingly good for its quality, durability, and rigidity. At first glance, it is a less costly clone of a tripod design that has been widely regarded as among the best in the amateur telescope industry. Right down to the stainless steel tubing for the legs and the leg extensions. 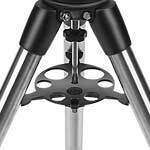 When spread and locked the SkyView Pro Field Tripod stands 32 inches (81 cm) high. By pulling out the 9-5/8 inch (24.5 cm) extension section, the Tripod height can be increased up to 40 inches (102 cm). The Tripod when set to minimum or extended height places the 80mm ED telescope at a height that is convenient for most observers. The SkyView Pro Field Tripod Leg Spreader Bar incorporating a convenient Eyepiece Holder. The Field Tripod Spreader Bar arrangement provides a stress that aids the rigidity of the Tripod, in this way it mimics the industry standard Meade Instruments Field Tripods. The Spreader easily rotates out of the way to permit the three legs to collapse in for storage. But Orion has taken this a step forward by providing holes in the Spreader so that it can hold up to five 1.25 inch and two 2 inch diameter eyepieces or other similar diameter accessories. Furthermore, this tray is held in place by two keyhole shaped screw holes so that customers may easily slide the tray up and out to remove the tray for transport or if desired. Left: the SkyView Pro 8 Field Tripod Leg Spreader Bar (161,618 bytes). To keep dew or other contaminants from marring eyepieces stored on this tray Company Seven recommends you keep eyepiece caps in place when these accessories are stored in the accessory holes. And for use in areas of high humidity consider the use of optional dew prevention devices including our highly successful Kendrick heater systems. With the standard Single Axis Clock Drive and provided Piggyback Camera Mount on the Mounting Ring the owner is equipped to pursue introductory astrophotography producing results that many amateurs would be proud to put on their wall. Battery Pack included. Accepts eight "D" cell alkaline batteries or optional 12 volt D.C. rechargeable pack for operation in the field. Receive a FREE Starry Night Special Edition software suite. 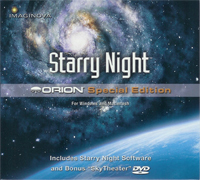 Both the highly acclaimed planetarium software by Imaginova "Starry Night Special Edition" with a bonus "SkyTheatre" DVD are included FREE with purchase of any Orion-brand astronomical telescope from Company Seven. "Starry Night Special Edition" is a basic version of the more capable "Starry Night" version 5.0 astronomy software series; this software will help you learn the night sky, see what is up day or night, now or in past millennia, plan your observing sessions, and print out charts and information about the celestial wonders. The set also includes "SkyTheatre", a DVD by Imaginova so your television or PC becomes a spaceship on a voyage through our Solar System. The set is compatible with both Macintosh computers running OSX version 10.3 or later, and with Windows XP for PC. Your personal planetarium and guide to the night sky! Left: CD-ROM "Starry Night Special Edition" with bonus "SkyTheatre" DVD suite (43,322 bytes). Click on image to view enlargement (85,180 bytes). To read additional information about the Orion 80ED sold by Company Seven feel free to download the Orion SkyView Pro 80ED EQ Telescope Instruction Manual. This is the complete 28 page illustrated instruction manual as furnished with our 80mm ED telescopes when packaged with the Orion SkyView Pro German Equatorial Mount. Publication content by Orion Telescopes and Binoculars, all rights reserved. From Company Seven's Archives. 2,949,488 bytes (in Acrobat Reader ".pdf" format). For more information about the SkyView Pro Equatorial Mount download the Orion illustrated instruction manual from Company Seven's Library. This download size is 606,874 bytes (in Acrobat Reader ".pdf" format). To read about the optional True Track Single Axis drive for the SkyView Pro Equatorial Mount download the Orion illustrated instruction manual from Company Seven's Library. This download size is 432,670 bytes (in Acrobat Reader ".pdf" format). "a series of subtle improvements"
All of the information we provide on line and by phone, or by E-Mail, with our expertise and our unrivaled showroom and museum (an increasing rare sight), and the fact that one may buy the basic instrument from us or elsewhere at about the same cost should be enough to persuade one to choose Company Seven. However, we do even better; we make it in your interest to buy from us. While Orion has been quite good at having the factories overseas produce a great value, once in a while something less than perfect slips by; a part is not machined just right, something is installed a bit off, a contaminant gets into the lens, or a component is damaged in transit. If you receive one of these telescopes, and if you know enough to recognize an anomaly then it is a simple matter to call Orion for a prompt exchange or replacement parts. We both have very good reputations for after sale support and a money back guarantee. But for those who buy their 100mm ED from Company Seven, they do so with the assurance that their telescope will be "ready to rock" that critical first night out! For no additional fee Company Seven will assemble and check through the telescope for you. This is similar to the standard service we have offered for more than twenty years on our more costly telescopes, and it is at times misunderstood and unappreciated by those who are ignorant of what we do. This all starts and ends with our technicians who have many years of experience building amateur and industrial telescopes; our services provide a telescope that realizes its highest potential. As we unpack each arriving 100mm ED we evaluate cosmetics, often cleaning off surplus glue or dirt. We make adjustments to assure each optical and mechanical component is nominally installed and aligned; we are happy to provide you with the optional tools to check this on your telescope if it becomes necessary and more importantly we will teach you how best to proceed. We know the tricks to make the telescope perform better: how to reduce glare or ghosting, etc. We work so that our telescopes will perform as well as experience shows they can, and as we process the telescope we perform some tests that will reveal to our experienced eye whether or not the optics were made as they could be. And finally, we generate additional information that is provided to the owner which characterizes the potential of the telescope for visual and photographic applications. One will never read a sad tale from someone who actually bought their telescope at Company Seven. We are so confident in our QC program that we promise if a telescope sold by Company Seven is ever returned to us with any manufacture related anomaly then we will correct it, return it to you at no charge, and reimburse your costs of returning the instrument for service! "expert counsel brings value to a transaction, and profit should be the reward for a job well done"
These are optional accessories that are not included with the telescope that we recommend you consider for your viewing pleasure and long term success. Mirror Diagonal: 1.25" diameter or preferably 2" diameter precision mirror so that one can comfortably view celestial objects with low magnification, wide angle eyepieces. The 2" to 1.25" Reducer provided with the telescope will permit the use of 1.25" eyepieces in an optional 2" Diagonal. Pole Finder Telescope: Astronomers often use a Pole Alignment telescope in a German Mount as an aid to quickly orient the German Equatorial Mount R.A. Axis onto the Celestial North or South Pole. 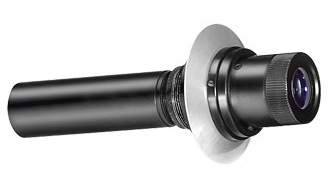 The eyepiece of this small telescope incorporates a reticle pattern that aids Pole alignment of the Mount in both and the Northern and Southern hemispheres. The Orion SkyView Pro Mount accepts an optional Polar Alignment Finder telescope. This accessory threads into a fitting on the mount head R.A. Axis shaft. For transport the Pole Alignment Finder is protected by a slop on plastic cover as it protrudes visibly from the mount head and would otherwise be vulnerable to (at the least) misalignment from impact damage. Right: Orion SkyView Pro optional Pole Alignment Finder Telescope, eyepiece with focus control is at right end. Click on image for enlarged view (19,867 bytes). If setting up an equatorial mount in a permanent location, then other techniques can be used to gradually "zero in" a mount onto the Pole to obtain even greater accuracy. However, the Pole Finder is an especially desirable aid to quick alignment for people who are transporting the mount from one location to another. The telescope is provided with a 6x 30mm Finder, this is rather small except for centering relatively easy to find bright objects. We suggest upgrading to a better 50mm Right Angle Finder such as the Orion 9x 50mm Correct Image Finder. Or you may prefer a reflex sight such as our compact Rigel Qwikfinder, or the larger Telrad, or the "TeleVue Starbeam" illuminated sight: these will aid one in finding and centering objects in the main telescope and also help one learn the sky by "star hopping" from one object to another. Fortunately for those on a constrained initial budget, simpler eyepiece designs such as the Plossl, Orthoscopic will work well on this focal ratio telescope. If you prefer to see wider fields of view, and if you require long eye relief (distance from lens to the eye) to accommodate spectacles, then Company Seven recommends eyepieces of advanced designs such as those pioneered by Al Nagler, founder of the TeleVue company. TeleVue's advanced designs include the "Nagler", "Radian", or "Panoptic" series eyepieces. These oculars will provide the widest clear, and flat field images bringing out the most in your telescope (and many other) telescopes. For manually driven mounts in particular, wider field of views are also desirable since as the Earth rotates and objects drift across the field of view, a wide angler ocular shows an object for some time longer before having to adjust the telescope. The David H. Levy Guide to the Stars Planisphere If you are not familiar with the night sky then Company Seven recommends you buy a good simple Planisphere which makes it very easy for one to find out what constellations and major deep sky objects are overhead at any given time of the day or night. The night sky is mapped with the Constellations being those patterns recognizable to man since time immemorial. Constellations can be thought of as countries or states on a world map, where if you seek the Grand Canyon then you know to find Arizona. While in the night sky when one seeks the Great Nebula then one looks toward the Constellation Orion. The Planisphere is a two piece assembly consisting of one disc with a chart of the entire night sky, and an attached overlay disc with a transparent window and surrounding mask to simulate the horizons. 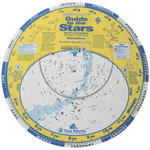 The overlay is dialed to line up its local time indicator marks with the Month and Day printed around the edge of the chart disc, and so when properly set this will reveal what parts of the sky may be seen at any time of the year. The print is easy to read under day or red light. Once you begin to understand the way the night sky works with your Planisphere, the next step we suggest is to buy the Orion DeepMap 600 folding laminated Star Chart, edited by Steve Peters. Originally printed in 1997, the revised "Orion DeepMap 600" is among those indispensable publications that Company Seven recommends to anyone interested in learning their way around the night sky. The editor Steve Peters conceived of this as a very helpful device for anyone interested in astronomy and who may little or no observational experience. This has become the most popular chart of the night sky among our customers who are new to the hobby and who buy a telescope or binocular and now seek out what to see and when. This is often bought as a economical but valued and durable gift. Fully color illustrated, it is the first-ever star chart that folds up like a road map! DeepMap 600 shows the positions of more than six hundred of the finest celestial objects visible from the Northern Hemisphere. Each of these objects are plotted on a giant 33 x 21 inch full-color star chart by world-renowned celestial cartographer Wil Tirion. But what really makes this star chart invaluable is its convenience; it folds "accordion style" into a thin, pocket-size 4-¾ x 10-½ inches format - just like a road map! Equalizer: A slip fit machined bronze, heavy 2 to 1.25 inch diameter reducer adapter. Helps to keep telescope balance when switching to and from light and heavy accessories and eyepieces. Particularly helpful when using telescope with Alt-Azimuth mounts. Camera Adapter: The Orion 80mm ED is at its best in astronomical applications, but may be used as a terrestrial telescope, or as a Super-Telephoto lens for video or 35mm film uses. Focal Reducer: For visual or photographic use - sold as a courtesy ONLY to those who bought their 80mm ED from Company Seven. Shortens the effective focal length of the 80 ED telescope from 600 mm (f7.5) to 480mm (f/5.3). 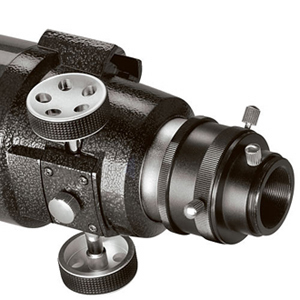 Corrector provides 35mm format Fields of view of up to about 5 degrees! Orion zip up fitted and padded Carrying Bag (example made for an 8 inch Dobsonian telescope is shown at right) for safer, and more convenient transport the telescope optical tube assembly. The carrying handles are offset to allow one to easily balance the rear heavy telescope in the hand or over the shoulder. Keep in mind that these are very convenient and lightweight bags, but are not suitable for shipping a telescope. Extra Counterweights available each of either 4.5 lbs (2 kg), or 7.5 lbs. (3.4 kg), or 11.9 lbs. (5.4 kg.). Extra Dovetail Plates are available to permit the quick installation of other telescopes too! Lengths are: 8-1/2 inch (21.6 cm), or 13-1/2 (34.3cm). The telescope is available assembled and precisely collimated by Company Seven's experienced staff. The telescope includes the Orion One Year Limited Warranty and this is complimented by Company Seven's own guarantees and service facilities. With proper use and maintenance, there is very little that can go wrong with a telescope such as this - if there is a problem then it is likely we will have found it for you and so with the exception of normal wear and tear, or Diagonal mirror coating, Company Seven backs our telescopes for life.